It rarely snows in Rome, even in the depths of winter, but it snowed in Rome this past Monday, August 5. The temperatures have been hovering around 36 C (upper 90s F). 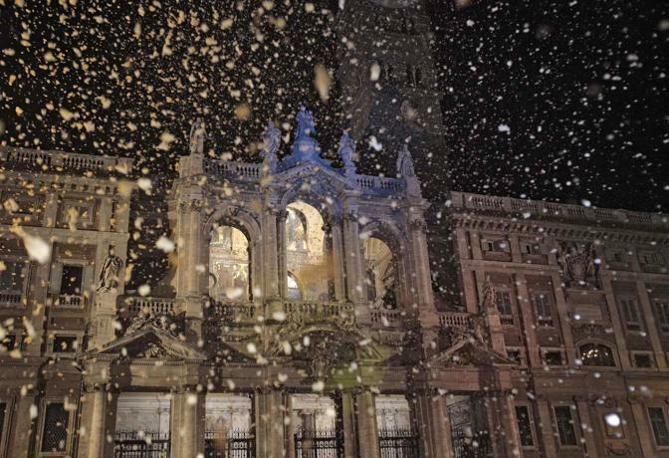 But on Monday, snow fell outside the Basilica of Santa Maria Maggiore, also known as the Madonna of the Snow. The snow was artificial, of course. People stood outside the basilica in summer clothing awaiting the cool flakes to fall. The annual event reenacts the Miracle of the Madonna of the Snow dating from the 350s when Pope Liberius dreamed that the Virgin Mary told him to build a church where snow fell. On the scorching night between August 4 and 5, according to the legend, snow fell on the Esquiline Hill. The basilica, one of the five in Rome belonging to the Vatican) was completed in 440. The Catholic church took no notice to either legend for about 1000 years. The celebration of the feast has had a varied history, celebrated first in Rome only, then in other churches around the world. Today, it’s celebrated as the Dedication of the Basilica. 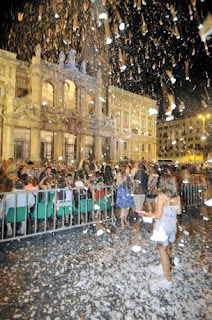 On August 5, during the celebration of two masses at Santa Maria Maggiore—in the morning and at vespers—white petals float from the dome onto the congregation. Originally these petals were from roses; today, they’re from dahlias. Beginning at 9 PM, a light show illuminates the exterior of the basilica. The festivities continue to midnight. Midway through the show, artificial snow falls on the crowd. Last year, the truck delivering the snow equipment broke down en route and the event was postponed to Ferragosto (August 15—one of Italy’s premier holidays). Just thinking about the snow can cool you down on a sweltering August night. Basilica of Santa Maria Maggiore. Buon Ferragosto! Thanks. It a fascinating celebration. I think it's appropriate for making people feel cool in Rome's August heat. In Washington, DC, a DJ named Bill Cerri instituted "Christmas in August" by playing Christmas music during August heat about 30 years ago. He's been dead for some time, but the tradition lives on with a Christmas in August concert. 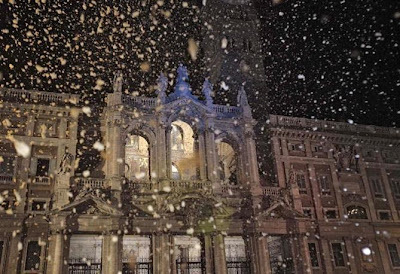 I think the snow at Santa Maria Maggiore serves a similar purpose.